Put sliced onions and oilve oil in a saucepan and add the grated zucchinis. Saute for 3-5 minutes. 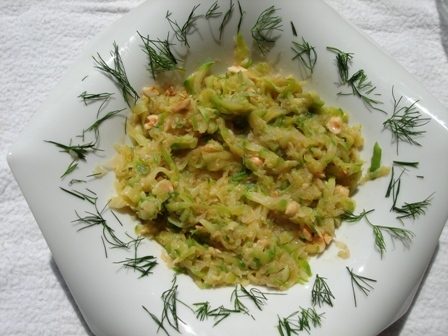 Transfer the zucchini-onion mixture to a plate and add hazelnuts. Season to taste with salt and red pepper flakes. Before serving, decorate with dill. 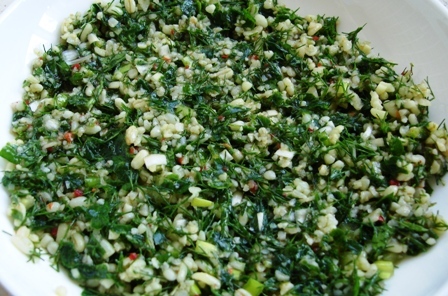 An indispensable and well known side dish in Turkey, which the main ingredient is crushed wheat grain~ that is bulgur. 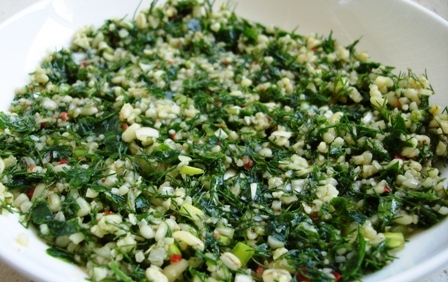 Bulgur is the basic food of Anatolia. Wash the bulgur thoroughly, then soak it in about twice its amount of water. The water will be hot to speed up the process, especially if there is little time. Meanwhile prepare the chopped vegetables. The quantities of the vegetables can be varied depending upon the desired outcome. 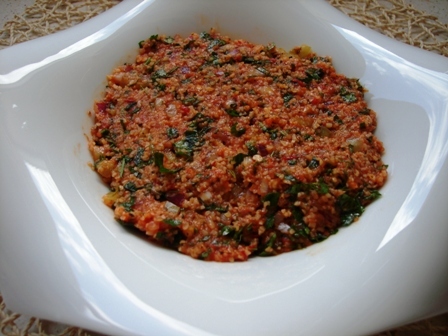 Drain the bulgur and squeeze out as much water as possible before adding it to the vegetables. Add the chopped vegetables. Put red pepper paste and tomato juice. Season with olive oil, lemon juice, salt and red pepper flakes according to taste. Serve with lettuce leaves and cucumber slices. I sometimes make the original recipe without paste and tomato juice, adapting to my personal taste. Spread the kadayıf and butter it. Grease a 15cm diameter round shaped mold. Place the shredded pastry into it and coat the mold with shredded pastry. Press with hands in order to take the shape of the mold as thin as possible. Bake in 175° C pre-heated oven until golden brown and crisp for 10 minutes. Remove the shredded pastry shell from the mold. Boil water and put the stellina shaped pastina. Cook until the pastina is al dente for 1-2 minutes. 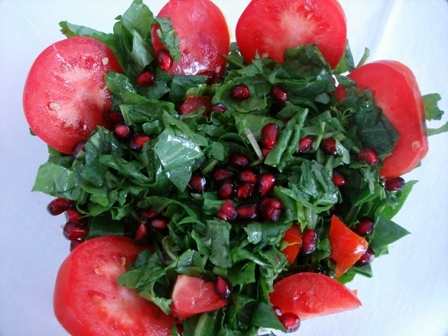 Toss the rocket leaves and the other ingredients together into a serving bowl. Combine the dressing before serving. Sprinkle with al dente pastina. Season with salt. 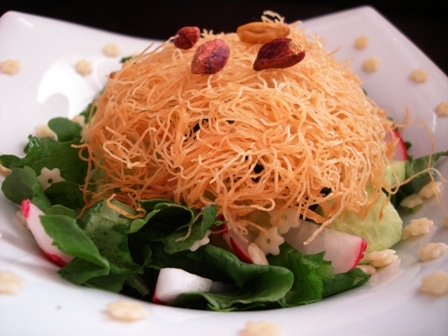 Put the shredded pastry shell over the top of the salad. Decorate with pistachios. 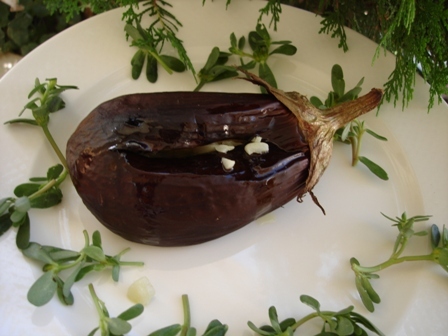 This Aegean and Mediterranean regions native vegetable is a natural anti-oxidant with a peppery flavour. 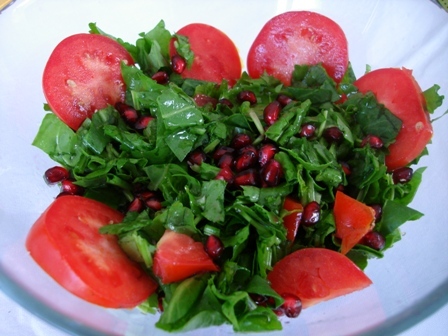 The rocket with pomegranate is not only delicious but also a very healthy combination. You can also have a look at another rocket salad recipe from here. Rub the inner part of a large bowl with garlic clove. It adds flavour to the salad. Then put all the ingredients together into the bowl. Mix the dressing ingredients. Drizzle the dressing over the salad. 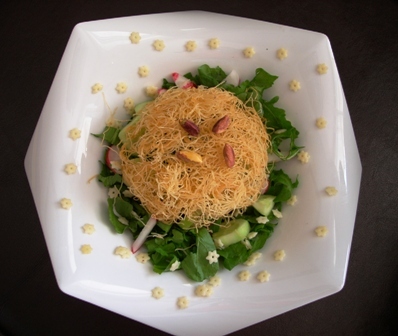 This is a very simple but a savoury salad. Grill the aubergines whole under a 220° C grill, turning until the skin of the aubergines is charred and crispy all over and the flesh is soft. Remove from the heat. Slit up each aubergine from one end to the other. Saute the diced garlic with extra virgin olive oil for less than a minute. 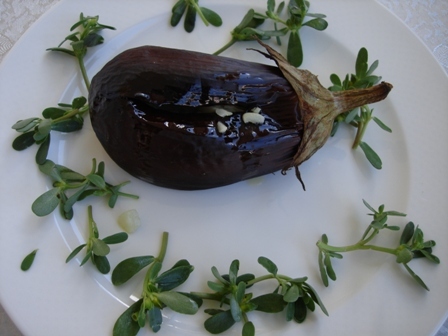 Before serving, pour the sauted garlic to each aubergine, where you slit up and serve hot. 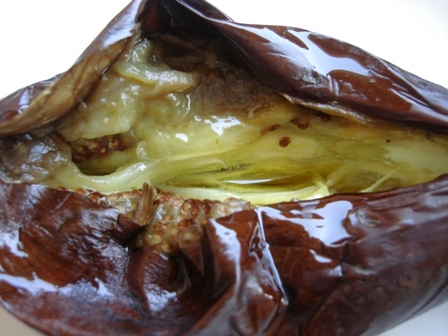 You are currently browsing the salads, sauces and pickles category at Aegeaneating.